I purchase a new Bob jogger and figured adding on the parent console would be nice. The cup holders are deep which allows me to take a nice size water bottle on my runs. I love the zipper compartment where I can hide my keys. Super easy to attach and clean as well. This is a great addition to our BOB. Itâ€™s is simple, lightweight and hassle free. Itâ€™s nice to have your drink and keys in a safe, convenient location. This is so nice and convenient to have on our Bob. Holds quite a bit of stuff! It fits the bob great! Excellent for holding keys, water, phone and some money. Secure and safety designed. A must have! This organizer is pretty basic, but much better than the generic brand I previously purchased! The little straps stay put and fit the stroller perfectly. No complaints! I should have purchased this one right away, not a no name brand!! It's a handle bar console. Holds two water bottles and your keys/phone. Nothing over the top exciting but it really is something you will want/need for your Bob. Fits perfectly on our Bob revolution flex. Just enough to storage without being bulky or in the way. I wish that this was a little more stable. The cup holder is deep so a canned beverage would be hard to get out. I wish one of the cup holders was wider. I have a water bottle that holds 20 oz and gets wider at the top and it doesn't fit very well. It serves its purpose and I wouldn't return it because I do need something to hold water and my phone while exercising. I love this console and it is my second one. Cups stay put and don't rock back and forth while running/walking. Sturdy and fits perfectly with the Bob single strollers. Would recommend this to anyone. The handle bar console is a must have and very easy to install and a great place for phones, drinks and other necessities. If you need cupholders/storage this is needed! The item arrived in perfect condition and sooner than expected. I shopped around to get exactly what my daughter and son-in-law had requested and Albee Baby provided the best price and fastest service. As far as the actual product, I can only assume it will perform as promised. Our little bundle will arrive late May, 2015. I will use this site again and again. Thank you. Great place to keep drinks and keys! Not sure why they don't include this, but it's great! I love this added accessory for my bob stroller! I love that it has 2 cup holders and a zip up pouch so i can store my keys and phone. A must have for my BOB. The drink holders are great, but the zipper pocket is my favorite. It's much bigger than I anticipated! I can hold my phone, keys, and a few other misc items. ProsEasy to install. Size of zipper pocket. Two cup holders. Fits so nicely on the stroller and keeps so much in it! Very handy to have for keys ,bottle, pacifier, water , coffee,any thing you will need on a walk with baby.Bought 2 one for my daughters stroller and 1 for gramma and grampas stroller. This is such a great item and a need for the BOB stroller. Albee Baby has it for a good price too. I checked a lot of places and the price here was best. I love this cup holder, it is nice and deep so that it holds water bottles and the zipper pocket is also huge. I wish I would have bought it right away instead of waiting 2 years!! It's nice to have a sturdy place to zip my cell phone into and not have to bend over and dig around on the bottom of the stroller when/if it rings. Must have accessory to go with the bob - love having it! Only down side is that the cup holder can squish a paper/plastic coffee/tea cup from Starbucks etc, it will squish the cup and pop the top off - I had to get my husband to cut a piece of PVC pipe and put that in one of the cup holders so it would stop squishing my tea cups! Prosgreat little zip pouch for house/car keys, cell phone, soother & lip gloss - nice to be able to have a couple small things right at your finger tips! The Handlebar Console provides the stroller user with two watterbottle or drink holders along with a zippered storage compartment for keys, cell phones or other small items. 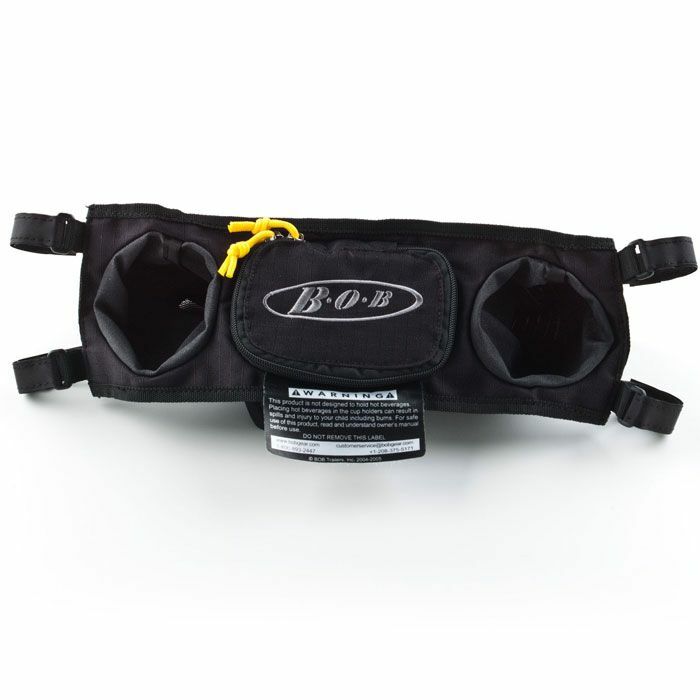 Made from a Rip-stop Polyester, and attaching with four velcro straps to any bob single strollers. This, at your finger tips storage, will make strolling and running with your BOB that much more enjoyable.